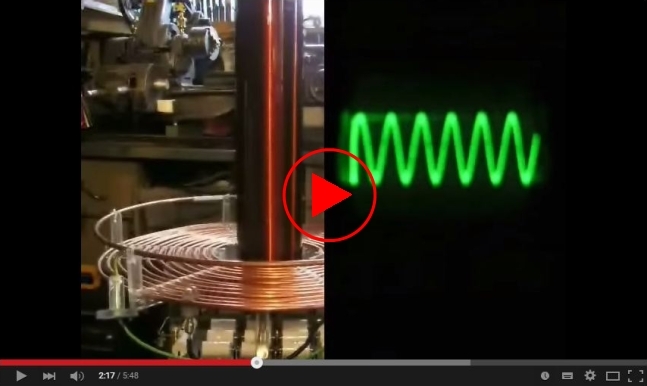 Tuning a tesla coil can be done in various ways depending on what equipment you have access to. The most accurate is with an oscilloscope and signal generator. Another method is to use JavaTC the software design program, which will give a good estimate of the resonant frequency and where you need to tap the primary coil. In both cases you can get the best final tuning point by testing different tap points close to the estimated point, to get the best result. It is also always a good idea to initially run at a low power, as if the coil is badly out of tune and ran at full power, you could cause damage, either to the secondary coil or the capacitors. If you have not used JavaTC then now is a good time to get it and use on the coil you have already built, otherwise assuming you do not have an oscilloscope, you could calculate the resonant frequency yourself. See Here or Here for the necessary formulas. The basic procedure is either measure or calculate the resonant secondary frequency (with the toroid fitted) first of all, and then use this value to work out the correct point to tap the primary. What you're aiming for, is for the final tapped frequency on the primary, to be just slightly lower than that of the secondary frequency. Strictly speaking the primary frequency should match the secondary frequency, but when a streamer forms on the toroid it adds capacitance to the circuit and this loading causes the secondary's resonant frequency to drop slightly, something that is often overlooked. The amount that it drops will vary depending on how long the streamer is, and where, or indeed if, the streamer strikes anything. But by making the primary a bit lower, it means when the secondary frequency drops, it will then hopefully match the primary one. An approximation of the amount of frequency drop can be obtained by trailing thin pieces of wire from the toroid to nearby objects, and then remeasuring the resonant frequency of the secondary circuit again. These simulated streamers should only be the length that you know the tesla coil is capable of. Streamers less than three foot, probably won't affect things much, so with a small coil it is usually best to tune the primary the same as the secondary frequency. By trying different lengths and horizontal and angled positions you can then come up with an average frequency drop to aim for. You then tune the primary to this new frequency. I aim for up to 10% on my 8 inch * [Note: 1], and less than 3-5% on smaller coils, but trial and error is the only way to find out. It will mean of course with this method that the primary is initially slightly out of tune before a streamer forms, but it then comes fully into tune when a streamer is present. This initial out of tune period does not seem to affect things, but the fact that it comes into tune when a streamer forms, makes for longer streamers or sparks overall. Unfortunately you can only use this method to make allowance for the effect of streamers if you are using an oscilloscope and a signal generator to tune your coil though. (Above) Tuning the Primary The 10K** resistor is very important so don't forget it. Without it the scope is just sitting across the generator's output, so it will only see that output voltage and hide that of the coil's resonant rise. ** 10K is the best value for my own signal generator, you may need a different value. The instruments are connected as shown above. On the secondary's example, the wire simulating a streamer is optional, and the probe must not be allowed to swing or move around, otherwise it will upset the reading. Set the signal generator to an initial frequency around 20 to 30 kHz below the expected frequency. Then gradually increase the frequency and watch the oscilloscope display for a peak. At some point the voltage that the oscilloscope is measuring will sharply increase, then abruptly decrease. Just how suddenly this occurs is affected by the coarseness of the tuning and the coils own characteristics. I modified my own generator so that I had quite fine tuning in the range of 50 to 150 kHz (suited for my coils). You will most likely find that there are several other points where the voltage peaks (harmonics), but there will always be one dominant peak. This will be located closest to the expected frequency, whilst the other harmonics will be either side. Having a good idea of the expected frequency before you use the oscilloscope method, can be essential if you get a lot of harmonics, as otherwise you could easily end up tuning to the wrong frequency. On the primary for my 8 inch "Phoenix" coil, the lead from the MMC to the primary was a bit long and greatly affected the results. If the lead was routed in one direction it would give a different frequency than if routed in another direction to exactly the same tapping point. This is something that you must check, as it can catch you out if your not expecting it. The answer of course is to shorten the lead so it runs direct, once you know where you want the tapping point to be. This is similar to the concept of using off-axis tuning where you have a separate variable inductor separated from the main primary, but in my case it was unintentional and unwanted. A Circuit to view the resonance. This circuit is attributed to Antonio Carlos M. de Queiroz and can be found along with a lot of other very interesting stuff on his site Here.. Antonio suggested using a 1 ohm resistor across the spark gap but I found I needed a 0.5 ohm to be able to see the correct waveform. 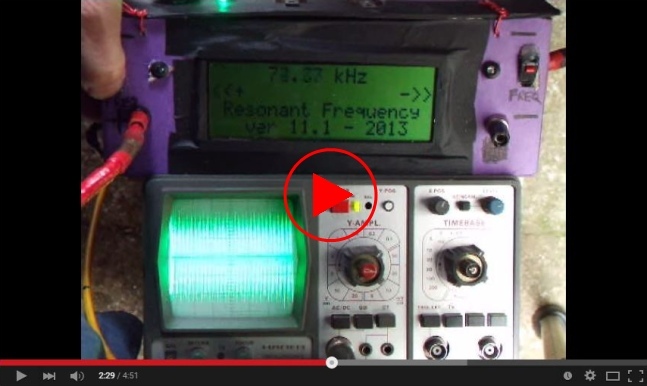 The frequency from the signal generator must be square wave and it needs to around 1 to 4 kHz for best results. Pic 1 shows the primary circuit driven by just the output from a signal generator. You can see the 'ringing' that occurs without the secondary in place. Pic 2 is the *secondary* ringdown trace of my small coil running, but the labelled notches refer to the *primary* ringdown. You can see the gap was quenching on the second primary notch. If the scale was zoomed out you would see that the secondary oscillations had ceased. This is quite good for a 1Kva on a static gap, but was helped no doubt by the fact that the streamers were not discharging to the air, but to a grounded rod. Once you have done all your tuning you want to see the difference and the only way to access things is to accurately measure spark length in a straight line between two fixed points and compare results. Anything over five foot and ideally you also need two of you. When a ground strike occurs it can sometimes be very difficult to accurately locate the point of the strike when you are some distance away. Because of this I video all my sessions to analyse after. Unfortunately I discovered the ground strike in photo 3 a bit too late, so the straight line distance was measured the next day by setting things up in exactly the same position (fortunately I had left the four pads that the base unit's wheels sat on in place among the gravel), and it appears to be at least 120 inches. My power input according to PSpice simulations of my SRSG using my known component values, was at that time 4.59kw, meaning John Freau's formula would only give me a length of 115 inches maximum, the extra 5 inches though is only a 4% formula error. Happily I did manage to achieve my 10 foot goal under more controlled conditions some months later (using 6Kw) as can be seen Here. The majority of the streamers in photos 3 & 4 were hitting the shrubbery behind unfortunately, so any real objective testing is just not possible in the garden. This is a classic example of building a tesla coil bigger than your surroundings can really accommodate - I doubt I will be the last to do that.